Comancheria is a solitaire game which transports players back to a time when prairie grass was yet to be trodden by wagon wheels. Back to a time when the Comanche were the "Lords of the Southern Plains." In Comancheria, YOU the player, get to make the key decisions as you guide your people on an epic conquest of the Southern Plains. As the player you must balance carefully the establishment of your people's culture against the relentless pressure of a increasingly hostile colonial enemy. 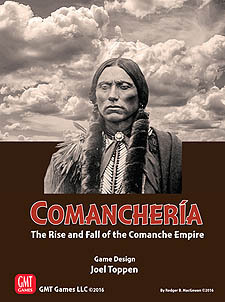 Using mechanics similar to Navajo Wars, Joel Toppen's Comancheria challenges you, the player, to conquer and control the southern plains of North America. It won't be easy, however. Aggressive northern tribes like the Osage, Pawnee, Cheyenne, and Arapaho will challenge your dominance of the hunting grounds. The colony of New Mexico has expansionist ambitions from the west. To the south lies Mexico and its new colony of Texas. And to the east lies the greatest threat of all: The united States of America. Heavily outnumbered by the colonial powers, you will need to use your superior mobility and tactical prowess to conquer and then maintain your empire against a relentless tide of hostile encroachment. Along the way you will witness historical events like the opening of the Santa Fe Trail, the Indian Removal Act, the founding of the Texas Republic, and the American Civil War from an entirely fresh perspective: through the eyes of the "Lords of the Southern Plains."